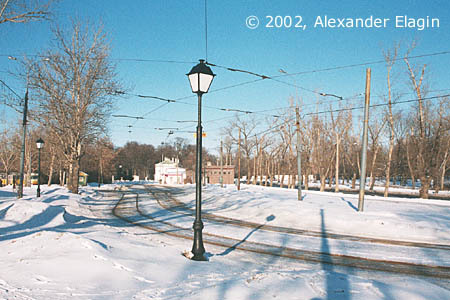 A tram line from Krestovskaya Zastava Square (beside Rizhskiy railway terminal) along Yaroslavskoe Shosse to Ostankino village was constructed in 1923. Once a far suburb of Moscow, this district in our days is considered "almost the centre of the city". 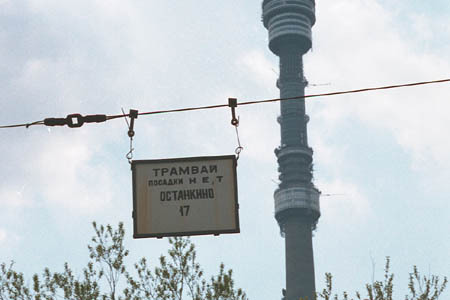 The line was the first to be built after the Great October Revolution (1917), so the start of tram operation was symbolic - it had to display the effectiveness of the new government. Anyway, the Soviet power is already in the past, while trams continue their routine but very necessary service under any rule. Currently there remains just a part of the line - from VDNKh to Ostankino. 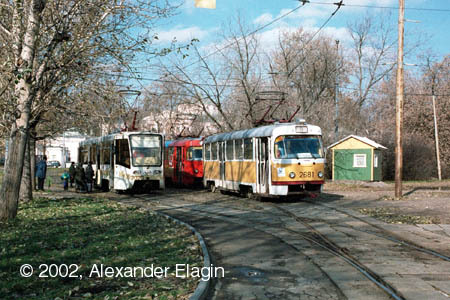 The line from Rizhskiy Terminal to VDNKh along Prospekt Mira (formerly Yaroslavskoye Shosse) was closed in 1995. 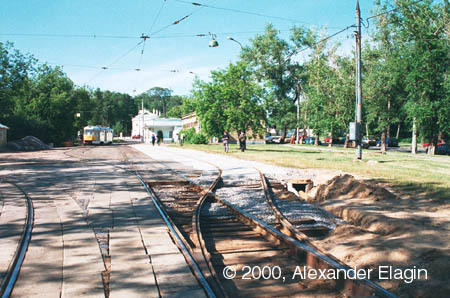 More changes happened in 2002, when the line from Ostankino to a crossing with 1st Ostankinskaya Street near VDNKh south was closed because of monorail construction works. The closure lasted for nine months, and regular tram service was restored on 15 October of that year. The control room and other services of Ostankino tram station are located in this rather small buildung. It was built in the spring of victorious 1945, when the war with the Nazy Germany was almost over. 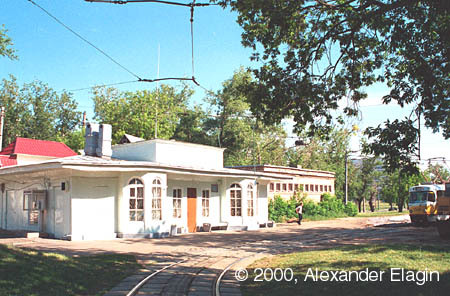 This is one of few still existing old tramway stations in Moscow. Ostankino Palace of Sheremetevs, now being a museum. The Palace was constructed in 1791-98 by serf architects. There is a vast garden laid out for Count Sheremetev in 1793 behind the building that exists to date. This place is worth attending for everyone who visits Moscow. The tracks of Ostankino terminus. In June 2000 there was constructed the third track there, which you can see in the right (paved with white concrete slabs). The same place two years later. Nothing has changed in general, only the concrete slabs got darker and rails got rusty because no tram had used them for a few months. The Ostankino TV and radio tower, being one of the world's highest buildings. 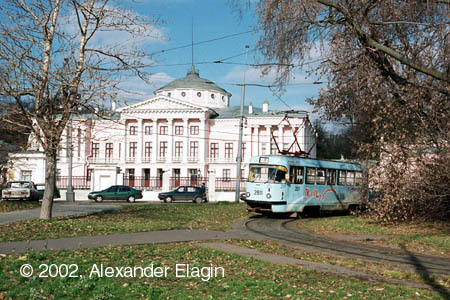 It is located rather close to Ostankino tram terminus, beyond a large pond and a broad street. The sign reads "Tramway. Ostankino. No boarding here". Trams returned to this terminus in October 2002, and commuters are very happy to use this transport again. And finally - a general view at the terminus looking from the south. 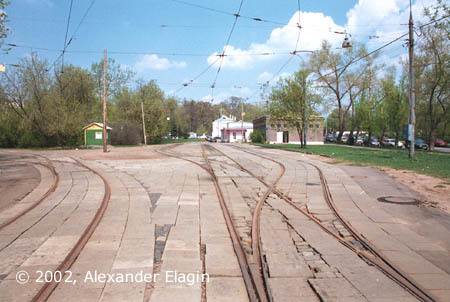 Tracks turn right to 3rd Ostankinskaya Street.